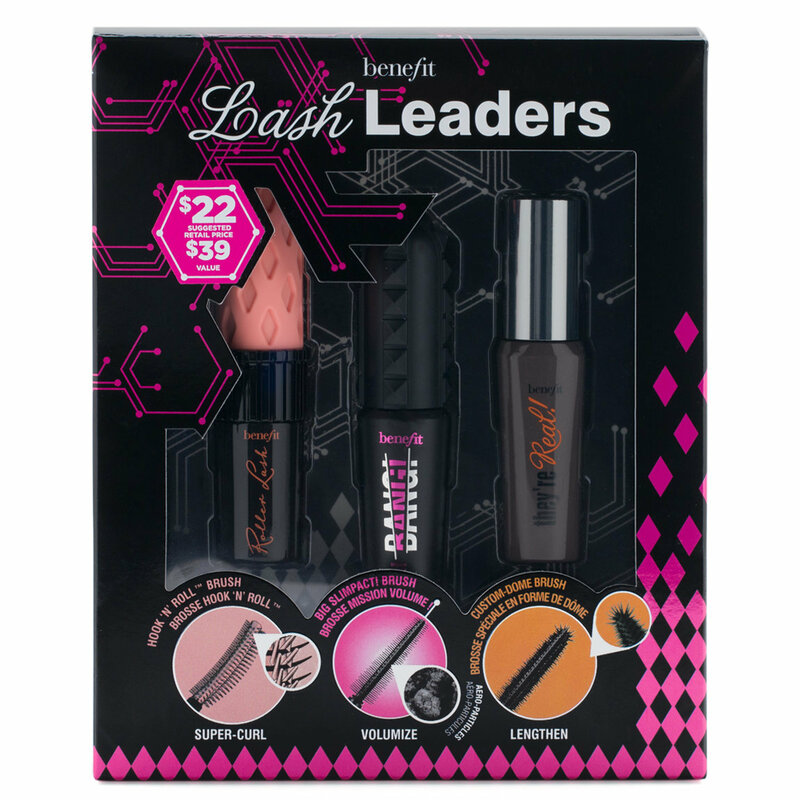 Get mini sizes of Benefit’s 3 bestselling mascaras in one blockbuster set! Add major volume with BADgal BANG! volumizing mascara, get length beyond belief with they’re real! lengthening mascara, and curl & lift your lashes in an instant with roller lash curling & lifting mascara. Wear alone, or layer together for endless lash looks. It’s everything you need to volumize, curl & lengthen lashes… all at a MAJOR value! Roller Lash Curling & Lifting Mascara: Gently wiggle the wand from the base of lashes to the tips. The eye-opening Hook ‘n’ Roll™ brush grabs, separates, lifts & curls, while the instant curve-setting formula holds for 12 hours. Badgal Bang! Volumizing Mascara: Using quick & gentle strokes, wiggle the big slimpact! brush from the base to tips of lashes. Layer to build lash volume, separate & coat every lash. To get the biggest BANG, apply to upper & lower lashes. They’re Real! Lengthening Mascara: This specially designed brush works to capture & lengthen every lash! Position wand horizontally and wiggle from lash base to tip. Next, flip the wand vertically & stroke in an upward motion to coat hard-to-reach lashes for maximum length & lift!